Whether your goal is to surprise your guests or advertise your entertainment to build anticipation, booking big name acts for your San Antonio area event, whether at the JW Marriott San Antonio Hill Country Resort or The Westin, is crucial to its success and far easier to arrange that you'd anticipated. 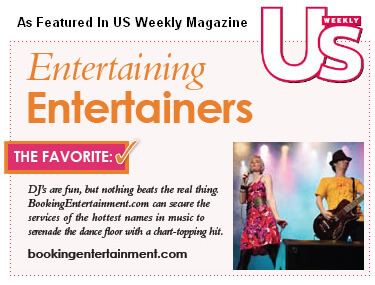 Booking Entertainment has been providing full service, turnkey events for clients seeking to reserve headline entertainment for their San Antonio area events, providing all in one, no surprise price, for almost twenty years. To help make your San Antonio area event exciting and rewarding, almost any act is available. All of the same components go in to live entertainment at your event, no matter the venue. These components include not only an onsite team to produce the musical portion of the event, but also fees, flights, hotel accommodations, ground transportation, staging, sound, lights, backline equipment, per diems, and misc. rider requirements. But clients can relax and enjoy their favorite act with their guests, knowing that Booking Entertainment is handling all these responsibilities flawlessly. The Entertainment Request Form available here is the best place to start. By filling out some details, we can get a better idea of your needs for your upcoming San Antonio area event. Within twenty-four hours, an agent will contact you to answer any additional questions and discuss the process with you. The agent will return with a turnkey price for everything mentioned above once the right act has been narrowed down. Clients can confirm at this point whether or not they wish to move forward, and have the agent submit the formal offer to the entertainment chosen. Once the act accepts the offer, Booking Entertainment issues contracts and handles everything else. Booking Entertainment would love the opportunity to take its sixteen years in the business and use it to make your San Antonio area event an unforgettable experience. We can handle just the contracting of the talent, in the role of an agent, or we can also handle the entire entertainment portion of your event, as would a producer. You can select from our wide range of available talent, or if you don't see the act of your choice listed here, you can let us know what you have in mind. If you're uncertain, we can help you select the perfect act for your occasion. Questions? Need further assistance? We'd be delighted to receive your emails, so that we can help ensure that your party or event is exceptional.